Select File →Open →Server Data Set from the main menu. The dialog box in Figure 2.2 appears. Click the node labeled with your server name to open it. 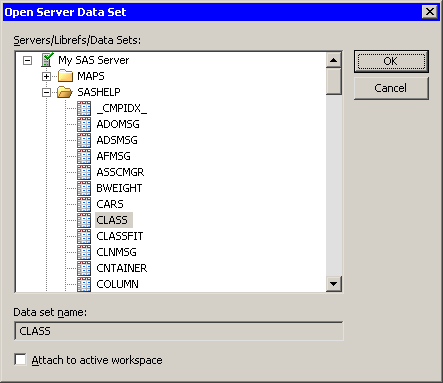 If the SAS System is running on your PC, the server name is My SAS Server. Click the SASHELP folder to view the data sets in the Sashelp library. Select the CLASS data set. A data table appears, showing a tabular view of the data. There is a DataObject (not visible, but still present) connected to the data table. Note: Figure 2.2 shows librefs that are not predefined. If your PC is your SAS server, you can create an AutoExec.sas file in the C:\ root directory that contains LIBNAME statements that define librefs on your PC. Everytime a SAS server starts, the SAS System executes the AutoExec.sas file automatically. If you are running a SAS server on another computer, ask your site administrator to set up librefs for you.